Young fit woman lying on yoga mat tired after workout. Woman taking selfie photo after sports in gym. Young athletic couple taking selfie at gym. 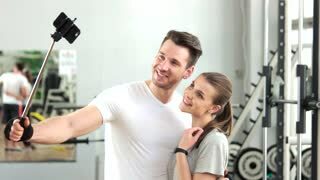 Young man and woman taking a photo with selfie stick at fitness center. People, sport and technology.